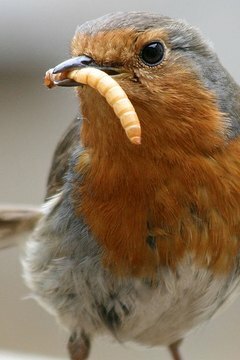 Live mealworms make an excellent, protein-rich food for small animals, birds, and some types of fish. They are not actually worms, but the larvae of the darkling beetle. Raising a mealworm farm yourself is an interesting and inexpensive alternative to buying them from a pet supply store. Mealworms reproduce easily, so if you feed and care for them properly, within a few months your pet will have a good supply of food that lasts indefinitely. Spread a two-inch layer of fine wheat bran, cornmeal, or rolled oats on the bottom of the plastic container. All of these are good food/bedding material for mealworms, so decide which one works best for you. The finer the material, the easier it will be to collect the mealworms. Put the mealworms on top of the bedding. Add some small fruit or vegetable pieces like carrots, cabbage, apples, potatoes, or kale. These will both feed the worms and help maintain the proper moisture level of the bedding. Change the fruits and vegetables regularly before they begin to dry out or get moldy. Cut a few sheets of newspaper so you can lay them on top of the mealworms, leaving some space between the edges of the paper and the container. A lot of worms will crawl into the newspaper layers, which will make them easier to harvest. Spray the paper once or twice a day to moisten but not soak it. Keep the container in a warm place to promote fast growth and maturation, or a cold place like the fridge to slow growth. Do not cover the container, as the mealworms need plenty of air. Add more bedding material regularly as the worms eat it. Clean the bedding every month, or sooner if it starts to smell. Sift out the worms, beetles, and eggs, and throw away all the bedding. Wash and dry the container, and refill it with fresh bedding material.